Boeing and Virginia Mason have a long-standing partnership. 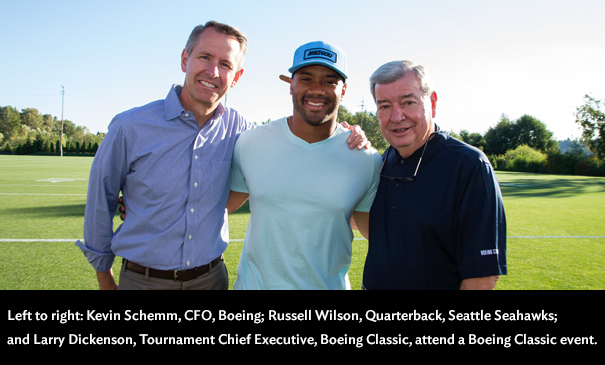 Boeing supports Virginia Mason as a Legacy partner, through the Boeing Classic Golf Tournament title sponsorship and by providing leadership on Virginia Mason boards. Boeing employees also give time, talent and donations to Virginia Mason. Since the Boeing Classic began, more than $6 million has been raised to support medical research at Benaroya Research Institute at Virginia Mason (BRI) and other local charities. “We are honored to play a role in this important work that makes such a difference to the people in our communities,” affirms Kevin.